Business analyst tired of doing business process modeling using traditional software? Well we are here to change that. 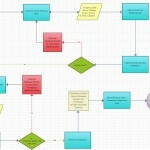 We came up with a set of tools that will make business process modeling faster, easier and fun. So how are we going to make it fast and easy? Below is a summary. Click on them to learn more on how they will speed up the process. We are proud to call ourselves a productivity tool, which is why we have added some cool features to speed up your diagrams and save you time. Features like 1-click create alone speed up the drawing 4 times compared to traditional diagram software. Whats more, check out our sticky containers which ‘understand’ how grouping in BPMN works like in Pools, Swimlanes and Processes. 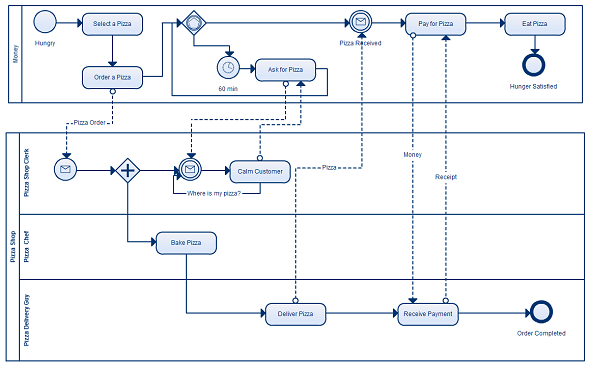 BPMN notation can get complex. Off the 12 core shapes, there are so many various modifiers that you can apply making finding and drawing the diagram a headache. We’ve simplified it with our awesome properties panel. So take a process and change the properties to make it have a different task type, make it loop etc. Our text based KObjects makes modifying complex objects like choreography a walk in the park. Just double click on the object and follow the instructions to create detailed choreography objects with ease. Problem with most drawing software is that they have too much options and less drawing space. With our contextual tool bars you will only see the objects that are most relevant for you. After that it’s just a matter of dragging and dropping objects and drawing your diagram.The BPMN notation library has all the objects found in BPMN 2.0 approved by Object Management Group. Don’t have time to create one from scratch? 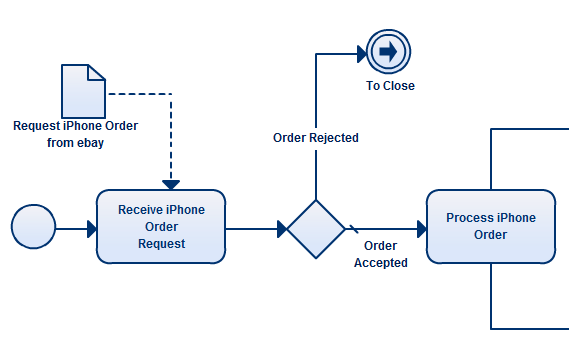 We got you covered with professionally templates drawn using BPMN technique. From the very basic to advanced templates. Change the text, drag a few processes and within minutes you have your own business model. Below are some business process model templates available to you. Click on any of them to instantly modify using Creately. Below is a more advanced example using most notation and swim lanes. With our real-time collaboration features you can share your business process with your peers and clients and get instant feedback on your diagram. Just share the diagram with anyone and both of you can work on the diagram together while seeing the changes made by each other in real-time. You can use this feature to explain the process to a client, present your model in a meeting and for many more things. An excellent productivity feature to compliment your diagrams. Any Reason to Not Try? An easy to use drawing interface, professionally designed business process templates, usability features to draw diagrams faster and real-time collaboration to work with teams make Creately an excellent tool for business process modeling. It’s very affordable compared to other diagramming tools like Microsoft Visio and offers many other benefits like anywhere access, platform independence, automatic updates etc. We love to hear from you. Your input helps us to make Creately even more remarkable. Send your suggestions and feedback to support@creately.com or you can reach us at Twitter or Facebook. For more info please check out this site on analyst training! We’ll try to add a post giving a more detailed explanation of notation objects in the future. Thanks for visiting and for the suggestion. This is really interesting, but adding one thing more. Could you give a detail description about each notation objects ?